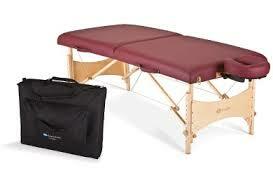 Earthlite Massage Tables - what makes them so popular with therapists! and what makes them so popular with massage therapists! Earthlite Massage Tables and Chairs are made of high-quality materials and are constructed to last through many years of everyday use. The company produces portable Earthlite Massage tables, stationary tables, electric lift massage tables, various Earthlite massage chair designs, massage accessories and massage therapy supplies of all kinds. EarthLite is committed to environmental integrity and recycling is integrated into manufacturing, whenever possible. The company uses no rainforest hardwoods' or wood from old forests. They rely solely upon farmed and renewable wood sources. The massage tables are ergonomically designed to fit various body types and heights, but are also built with a thick foam padding to provide the highest comfort for your clients. Earthlite's sturdy tables are made of the best Maple hardwood and Russian birch plywood available for solid, long lasting construction. Most tables are offered in a variety of colors and with many package options. Read why Earthlite is the table of choice for Atlanta School of Massage. Earthlite Harmony DX Portable Massage Table Package will give you not only a great table that will last forever, but the value and money savings of purchasing table products together. Table comes with a carry case. Working weight of 600 lb. In addition to massage tables and chairs, Earthlite also provides massage therapy supplies such as massage oils and creams, massage table sheets, massage tools, and the Zenvi™ Sound Cushion. Zenvi™ is a face rest with patented NXT SurfaceSound™ technology, which delivers high quality sound immersion through gentle vibrations in a soft-padded headrest. Music power source is concealed, yet the therapist can access it very easily. Connects to any portable audio device. This company produces tables that are "extremely sturdy and durable, with only the finest earth-friendly materials". You would have a hard time finding a better massage table anywhere....and that is why they are so popular with so many massage professionals! Earthlite tables are also "hand-crafted" ....and many offer a lifetime warranty....who wouldn't want a table like that in your massage room!